Last week I wrote about how there are two crucial changes needed to ensure the huge opportunity of the City Rail Link isn’t wasted. While I consider those the most crucial changes needed, they’re not the only ones that should be considered. 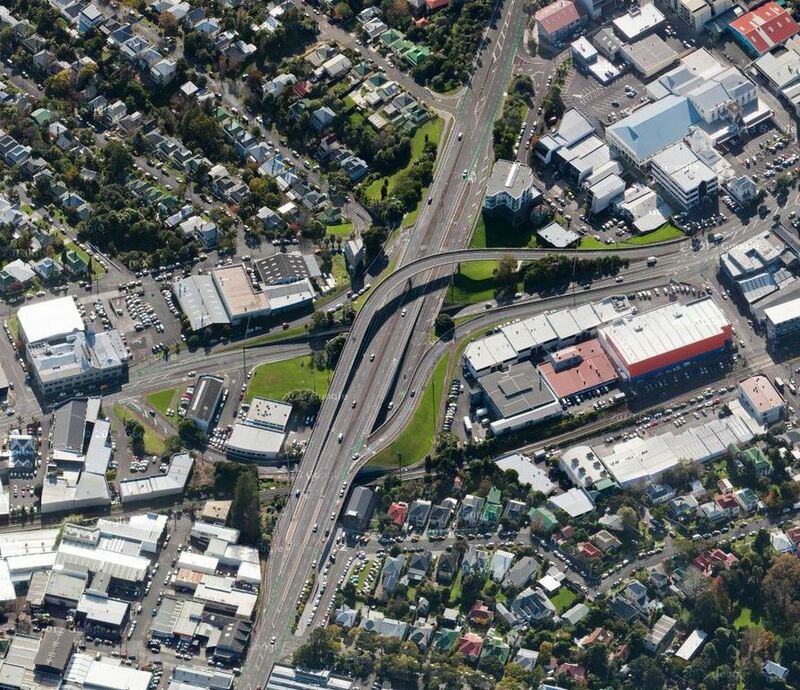 In this post I want to look at another important one, the location of the Mt Eden Station. It allowed for a grade separated junction at Mt Eden, which will improve reliability. It would be substantially cheaper than having to build a station deep underground. They said there was more development capacity around the station (in the section between Mt Eden and New North Roads) than was possible around Symonds St which had a number of heritage issues. This image was produced highlighting the type of development that could be expected from just the land used as part of the CRL works and you’d expect other nearby properties to be redeveloped over time too. But the question I want to look at in this post is if we’re making the most of the opportunities we have at Mt Eden. Is it best located to help facilitate easy network connections and does it best serve future development in the area. As we know, the new government have already supported the plans for Light Rail on Dominion Rd and eventually to the airport. Yet despite crossing each other, there is no easy transfer planned between the two systems, especially for those coming from the west. The most practical option is likely to be to transfer at Karangahape Rd. This is shown below. By the time you’ve travelled an extra 1km, exited the station, walked along Cross St to the light rail station on Upper Queen St, then travelled back down Dominion Rd, you might have added 10 minutes to a journey. What if we were to shift the station slightly westwards, and change the location of the Light Rail stations to enable an easier transfer. It could go from something like above to this, a much easier and faster connection. Shifting the station would have a number of impacts, but as I hope to explain, they may not be as serious as people first think, especially when combined with our suggestion to allow for longer trains. First, while there is an emergency exit at the northern end of the station, the main access to the station for the citybound platforms is at Ruru St. Shifting station westwards could still see the northern most access still relatively close to this position. But that could leave the other end of the (longer) platform much closer to Dominion Rd. This isn’t to scale but gives an idea of how it could be laid out with two platforms next to each other. It wouldn’t have grade separation for trains heading to Newmarket but given the poor use of resource that west to south services would be, we shouldn’t be running them anyway. Even just bouncing a shuttle back and forth between Newmarket and Mt Eden is likely a better idea and that this would support that outcome just as easily. An additional advantage of this is that by doing away with grade separation on that leg of the junction, it should make the build quicker and cheaper. So, what would the impact on development be? Because the northern end of the station would only about 100-150m away from where it was, all the development potential shown in the first image would still be possible and still within just a few minutes walk of the Mt Eden station. However, as well as better linking to light rail, this would also open up the station to another large development opportunity. As part of Light Rail, we’ll almost certainly be pulling down the space hungry eyesore that is the Dominion Rd Interchange that was built for a time when there was a motorway down there on the books. That development will open up a substantial chunk of land that could be redeveloped in a similar scale to the CRL land shown earlier. The image below shows approximately how much land could be developed from the CRL (purple), by freeing up land around the interchange (red) and couple of other sections that might be useful to tie in (yellow). As you can see, by shifting the station we could not only connect better to light rail but could put the station right in the middle of two large development sites with the capacity for possibly thousands of new dwellings. The biggest downside I can see to shifting the station is that it pushes it a little further away from the Uptown area of around Symonds St and Khyber Pass. What do you think about the idea? At the very least it would be useful for the council and government to consider it given it could help in achieving both transport and housing goals. I dont see any real advantage from ‘mode hopping’ here. Both the LR and rail routes travel up the Queen St valley across the K Rd ridge and through the same part of town before diverging. Mode hopping takes time and waiting for next service. At the 3 city locations, downtown , midtown and Krd you have the choice of either service depending on where you are ending up. Using the tram from the bottom of Queen St rather than the train and then transferring at the location for the new station to go to New Lynn doesnt make sense when you can catch the train for the entire distance. That is true if travelling from the central city, significantly less so if you are travelling from the west via rail and wish to transfer to the tram to head south (to Mt Eden proper, Mt Roskill or eventually the Airport). And vice-versa. This is absolutely about considering the needs of passengers: passengers that aren’t going to Queen Street. You have the whole western line on one side, the whole Dominion-Airport line on the other. For example, going from New Lynn to the airport requires a transfer between lines, as would balmoral to henderson, Kingsland to Eden Valley, Mt Roskill to Mt Albert, etc etc. A light rail all the way to the airport is aspirational, while this orphan station doesnt provide a junction between west and south lines, which is absolutely needed. Eg New Lynn to any of the stations along the southern line. Southern line trains won’t stop at Mt Eden station with the current CRL proposal either so there isn’t really any difference. If southern line trains could stop at Mt Eden I wouldn’t even be suggesting this. duker – the CRL tracks split before they get to Mt Eden Station and the eastern link, which Southern Line trains will use to travel between K Rd and Grafton does not have platforms at Mt Eden. Duker, mt eden station isn’t on the CRL, because it’s upstream of the junction it’s effectively the first station on the western line. Southern trains will run direct from grafton to karangahape and vice versa. It’s aimed at people going from west to south and vice versa not people changing modes going in and out of the city. You are correct that not many people would do that. Then wouldn’t connections on the Eden Light Rail Line be compromised? Just because it’s not in the CFN doesn’t mean AT won’t do it. AT’s initial thoughts were four LRT lines down Sandringham, Dominion, Mt Eden and Manukau Roads. Might many of the journeys you are trying to improve (involving a transfer from light rail to a destination near Western line rail or vica versa) be faster using a transfer to good crosstown bus routes, regardless of Mt Eden station location? Almost certainly less km to travel if so, but journey time would depend on bus frequency and interchange quality. Some of the inner ones possibly, but not most. Recall we are talking about two main lines that run from swanson to the airport via all points in between. You won’t get a competitive crosstown bus from Mangere to Henderson, for example. 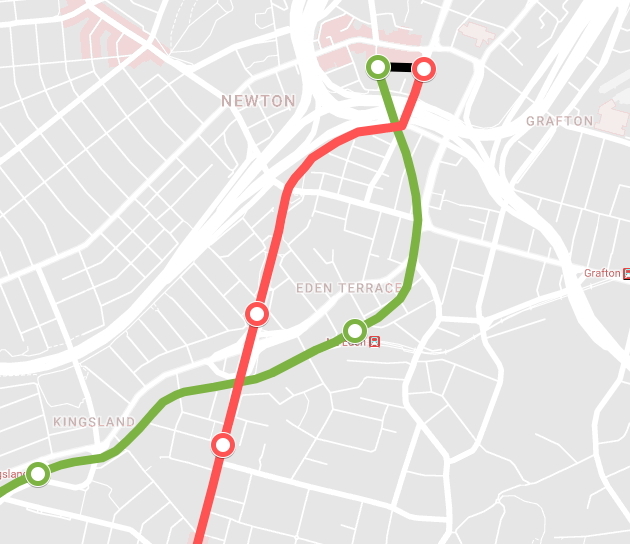 Also note that these two routes are going to be running fast frequent all day anyway, it requreis no extra service, vehicles or cost to link the two lines, while serving the same neighbourhoods with equivalent speed/frequency buses would. In other words, getting connection points in the right place gives you free network connectivity that is offers exponentially higher possible trips. Great idea. Forward thinking that makes long term sense as the city looks to increase density. Government would be blind to ignore this. I’m liking this idea. We must make it as convenient as possible to interchange between two modes of public transport. Mt Eden Station at its current location doesn’t allow for that. 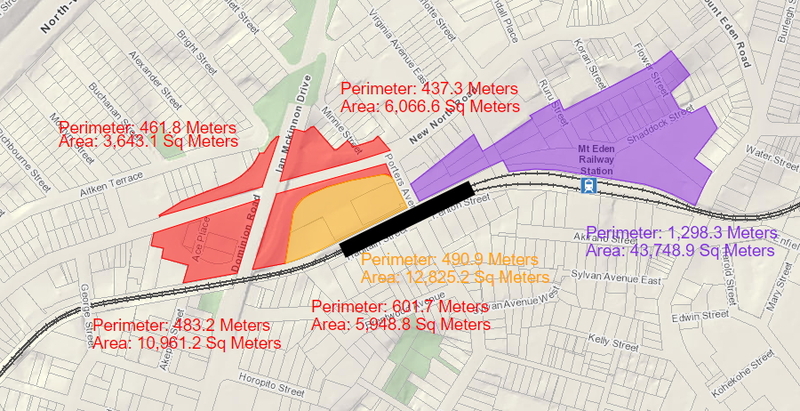 Moving the station nearer to Dominion Road would only add 200m (at most) of walking to access Mt Eden Road and would still meet all the requirements for connections to the CRL. Moving the station West definitely increases the attractiveness of an additional Crl station in Newton. How realistic is it to expect that the plans still can be updated to reflect this? I thought the build for the CRL was running on-schedule? If you dismantled the interchange, would vehicles travelling from the CBD to Haslett/Devon Sts still go down Alex Evans, or would you see them going via Piwakawaka? Finally, not being very familiar with the LR route, I thought that the route was to go through Upper Queen to Dom Rd via the most direct route – Which is via Alex Evans. Are you suggesting a more slender design for the bridgework? I do like the idea of changing the location per your post – I see it serving potential passengers quite a bit better. The suggestion is no bridgework at all, just a normal signalised intersection a fraction of the size. I can’t believe I hadn’t thought of that. A bit blind really, thanks! You’ve got the principle right. Any stop in any modern transit network should have capacity for an interchange with another line or another mode of traffic. Seems foolish not to. And the closer the better. If AT are not even thinking at this level already, it doesn’t bode well. A couple of things though – by moving the stop south, that would presumably make the next stop too close, and therefore untenable? And also – is one of these stops the one for Eden Park? Assuming that Eden Park stays open as a public stadium, then it would need at least one, maybe two stops to pick up passengers. And lastly – a petty comment (sorry) but still important: round up your numbers ! 5948m2 is way easier to read. At this stage of the game, no one is going to be that accurate to go to decimal places. Resumably the shops at Valley Road will always have a station, so that’s your closest station to Eden Park in any case. We’re only suggesting moving it by 200m and while closer to Kingsland, it’s longer to K Rd so lose on one end, gain on the other. I’d say build an easy 200m long pedestrian route from the already consented Mt Eden revamped station to Dominion Road and only shift the unconsented LRT station. It’s way too late to have a major change like this. It will only serve to delay the project. I agree with making the platforms longer and having both entrances at K’Road, but this doesn’t make sense to me. You’d have thought connectivity and whole of network thinking would have been two of the key drivers behind AT’s thinking about a light rail network. This post indicates they weren’t but rather suggests that AT has once again indulged in a value engineered, tick the boxes sort of exercise that will only satisfy immediate political imperatives while ensuring necessary change is something that happens at vast expense well down the line. Depressing. Just because the people whos job is doing this have a different view to yours doesnt mean they are idiots. Any sort of engineering requires multiple compromises and is not as black and white as you think. You have worked on major projects have you CT ? Yes even I have to concede there are one or two people at AT that are not idiots. CRL very much has tunnel vision (pun intended) and anything not directly associated with delivering it, such as streets, other connections etc. is considered “not our project/responsibility”. In other words it’s focused on delivering an engineering project, not an outcome for the city. You find that kind of silo thinking everywhere. Unless you have an executive overlooking the big picture (Mr Twyford being a good example), this is the outcome that you’re going to get. There is no way they are changing anything at this late stage. Currently it’s due to complete in 2023. You would be proposing adding a year of redesign, a couple of years of re-consenting and consultation, an uncertain extra time for land acquisition, and another year to go through the entire procurement process again. There’s a fair amount of extra cost in that, and time costs, for unclear benefits. Put your energies into the new stuff. You may well be right. However, AT are going to cop a lot of criticism over this for years to come, it would be good to at least hear their justification for not having a connection to the light rail network at this point. I was under the impression that MediaWorks was still being difficult over CRL vibration during construction. Does anybody know if TVNZ is being similarly difficult? Musings aside, I can’t help but wonder if the objections are based upon real concerns or an attempt to achieve a more financially favorable settlement. Ad, CRLL haven’t gone to tender yet, let alone have the tenderers come back with an indicative design, let alone a final construction design. CRLL will be expecting the contractors to make cost savings and add value, they won’t be expected to build exactly what is in the reference design. That’s not how infrastructure projects work. This should be able to happen without stalling the whole CRL project. 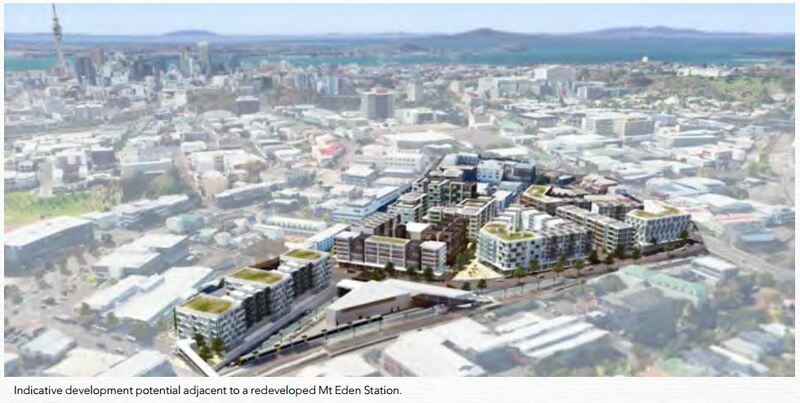 Just don’t start the Mt Eden station work until this has been approved or rejected. It’s a long project, you don’t necessarily have to stop all of it to figure out a change to one piece at the western end. From memory, the station work wasn’t going to be able to start until after the tunneling is completed anyway. If you get 3 years down the track, and find that you can’t get consent for moving the station further out, then continue with the current design. Newton getting further screwed is a pretty bad outcome of moving it. K’rd/Queen/Symonds should be a mega interchange for all he various services and a tie in to the connections to the north. Connections are where he current bus patterns fall down horribly – you can get to mid town at one end of the street and need to make a 10 minute walk to connect to britomart (may as well just walk from midtown). It’s very poor at the moment and the new network won’t address it, so I do t have faith in AT getting LRT connectivity right either, they still treat all transit as commuter A-B (even if you aren’t going to B) and totally ignore everyone else. Don’t apologise. Good and cost effective design comes from thinking about cycling and walking safety and amenity right at the start. Too often, the “additional” cost of providing the good amenity is then debated as if it’s an optional extra later. Yes we have a new government but the slow rate at which NZ develops means that we won’t see an inch of light rail in Auckland until 2030. Seems like there is nothing to lose and everything to gain by shifting it. It is not as if the existing station has ignited any development in that area. Moving the station westward would be at the expense of everything happening in Eden Terrace. And as others have said, they’ve started construction – it’s too late to do this without adding considerable time and cost. I know that high buildings are verboten in Auckland, but I can’t help but think that the low-rise medium-density development there is a wasted opportunity. They should buy out all land around the station and do an intergrated master planned mixed-used development like japan tokyo stations, with higher density with building more than 10 storeys. The transfer should be weather proofed with direct access around retail and residential. I’m going to take the opportunity to grumble about the how I won’t be able to take a train from Mt Eden to Newmarket. I reguarly do this as there are no bus services near me that are a good subsitution. I can’t get my head around the fact that services will travel past me while I stand at Mt Eden station but will not stop and all I will see is these happy smiling people laughing and waving at me while they travel contentedly on to Newmarket. I fundamentaly disagree with the concept of a service going past a station but not stopping. How is it future proofing or catering for growth on the network when an existing option is being taken away? And before anyone tries to tell me no-one travels that route and that’s a reason for not having it, just remeber we could have said the same about the whole network 10 years ago..
You will be able to take a train from Mt Eden to Newmarket via the CRL and Parnell. Or, more quickly, you will be able to take a train from Mt Eden to Karangahape and transfer to a service from Karangahape to Newmarket via Grafton. How long will the journey be once these ‘improvements’ have been implemented? With higher frequencies of trains post-CRL I imagine the journey time would be about the same as now. I suspect the curve is too tight entering the tunnels from the east to have platforms. Also there is a 3 tph crosstown route that will allow you to travel directly from Mt Eden to Newmarket. I hadn’t heard that recently. I did hear talk of that but then others have said there won’t be any so it’s hard to know what to believe. 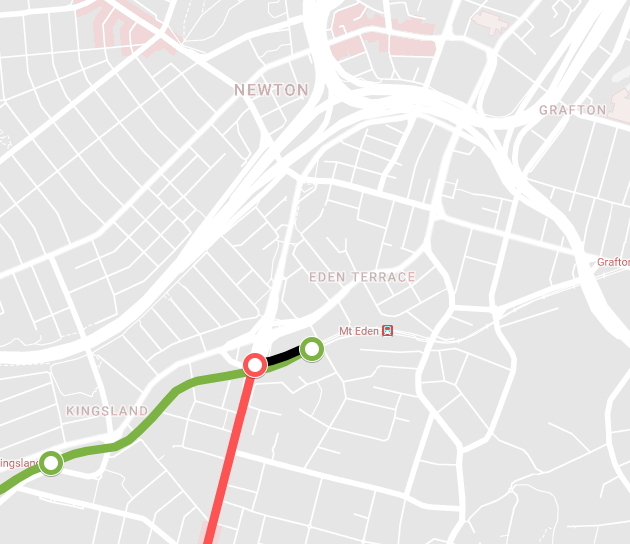 Someone on here recently said the only way would be to catch a train to K’Road and transfer which by adding 10 minutes + to the existing route seems like more madness. I still see it as a backwards step if the frequency drops though. I think you’re right that the curve is probably too tight, but surely thats a design flaw given how trains then can’t stop at a station that they travel past? It wouldn’t have passed my common sense test if I had any power. It is definitely a loss of service for a few, however I don’t think it would be viable to have a 200m+ straight section of platform on the eastern entrance to the CRL, there wouldn’t be the space. The original CRL plan had Mt Eden Station removed and replaced with Newton Station on the CRL, which was better for transfers but this did not allow for a grade separate junction and was going to be very expensive. Isn’t that exactly what you have at Newmarket? A long straight section of platform and a curved track out to the western line? Surely the other end/junction of the CRL needs the same treatment? The space you refer to can be rectified by the cost of aquiring land. In my mind, it’s a sub-optimal arrangement based on saving money. There are many of these in the CRL, platforms in tunnels not future proofed, no Beresford Street station at K’Road etc, etc…. I don’t expect the CRL to be gold-plated, just logical. Newmarket doesn’t have any platforms on the curve running from north to west as they wouldn’t fit, it’s only used for through running Eden Park event trains. All trains running from north to west through Newmarket have to turn around and go out the other way. The equivalent at Mt Eden post CRL would be for trains from the southern line to go into the station and have the driver walk to the other end and turn around. This would definitely be sub-optimal. Good point, that has always been sub-optimal. Those Eden Park event trains are a good example. The regular services we’re talking about that won’t stop at Mt Eden are just like the event trains not stopping at Newmarket. The problem with that set up is that not only can I not get on one of those trains if I am at Newmarket, but I’ve more than once seen tourists on those trains expecting to be able to get off at Newmarket only to see the train sail past down the western line and not stop. I can imagine many people unfamiliar with the network will jump on one of the new services expecting to be able to get off at Mt Eden and ending up at Grafton or K’Road. Currently we get an announcement on the Western Line services warning passengers that the train will not stop at Parnell, I imagine we would have to do that on all services that don’t stop at Mt Eden. If people can easily make this mistake and be inconveninced, the design is not logical. My understanding for the need to reverse at Newmarket was that the land required for the platform had been sold off for apartments and AT refused to make the temporary platform which removed the need for this permanent. According to the CRL info website (signalling diagram), the East Link southbound tunnel has a curve-radius of 134m. That is getting overly tight for a platform. Note that 4 stations on Wellington’s Johnsonville Line are on a 200m radius and that results in quite a gap between train-door and platform. Platforms do not have to be straight but 134m radius is extreme. 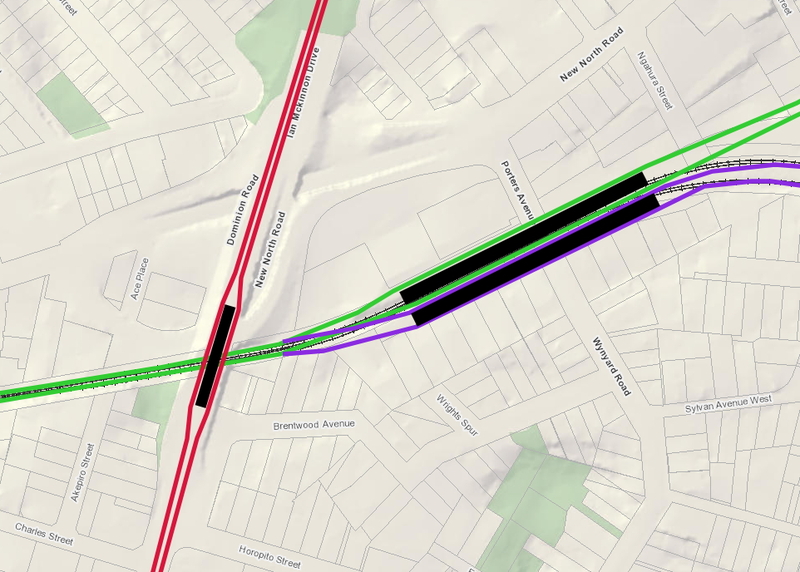 My understanding is that a 3TPH all-day service is proposed between Henderson and Otahuhu so this will provide 20min freq connectivity between Mt Eden and Newmarket. Rich you wont see them from Mt Eden Station, the southern line trains won’t go through Mt Eden station, they’ll be underground in a tunnel 300m away. Really? I feel marginally better about it if that’s the case. I had thought that they exited the tunnels well before joining the western line at Mt Eden. Have you got any links/information about that? The southern line coming out of the CRL doesn’t get to the surface until after Normanby Road, almost at Grafton station. Mt Eden station is in the complete other direction on the other side. Also… A shuttle between Mt Eden & Newmarket?? Seriously?? When has a shuttle ever been a good long term solution for to provide a service. Just build it properly so you don’t have to hack on shuttles. You would think in the middle of our biggest city we would have as many interchange options as possible so that we are making best use of the network. Assuming that the CRL Station isn’t altered, there would still be other ways of improving the interchange. At the bare minimum, a Light Rail station could be built on the bridge over the Western Line and a covered walkway could link it to Mount Eden Station. Or the Light Rail line could be routed via New North Road instead of Ian McKinnon Drive, but this might cause more problems than it solves. At one point there had been talk of Light Rail down Mt Eden Road too. Whilst I understand the value of running the airport Light Rail down Dominion Road due to the catchment potential, Mt Eden Road buses are some of the most heavily utilised routes there are, hence the introduction of the double decker buses. This has aleviated some of the 10+ buses that will be full and drive past each time you wanted to catch one, but Mt Eden Village is now pretty much at a standstill all day and is completely clogged. If the airport Light Rail used Mt Eden Road, transferring to Mt Eden Rail Station would be simple and 100’s of buses could be removed from Mt Eden Road. This seems like the best way to do it. I think the difficulty of doing that is that Mount Eden Road is narrower, steeper (I think) and has far more corners than Dominion Road which would all pose serious issues for Light Rail. The original plan for Light Rail announced last year had Mount Eden LRT terminating at Three Kings because the route south of there would be too steep. When light rail is eventually built down Mount Eden Road I expect it will have to run with shorter vehicles than Dominion Road and will probably require longer sections of track that are shared with general traffic lanes, so I doubt it will ever be a suitable route for LRT to the airport. There is one good outcome from the current land hungry more dispersed design, and that’s the incidental creation of public realm out of the resultant space between the two sets of platforms. So if the more spatially efficient option Matt proposes is adopted it would be good if a high quality pubic plaza is still delivered in the redevelopment, ideally still connected to the station, as that is likely to have high pedestrian traffic, and will attract cafes and other people focussed amenity. We really need that Southdown-Avondale line built. With the big investment being made to northland rail, that must mean a lot more freight movements along the NAL. It would also be the fastest way for west auckland passengers to get to Onehunga and the light rail connection there. You mention cost, but why would you not cut and cover the HR line to allow it to pass under the LR line? It’s another 1000m2 (?) that can be built on top of, and the sale could offset some of the cost. There will be service interruptions but the sleeker design would be appreciated after the interruptions stop. I suspect the horse has already bolted on the already decided designation, and would be concerned with any changes now risking dragging the whole project out. Nice idea the land development & ease of transfers, but I do quite like the grade separation – also line speed increase (could we not have grade separation still with shifting the station west?) – very confusing plan this station as can be seem by some comments above. K’Rd Transfers it is, at least it may keep this bit of town super busy & so safer. Yes, move the station. Dominion Rd has the busiest bus lane (or had??) so it’s always been a shame that there was never an easy connection to bus up Dominion Rd, then train out west. Or visa versa. And with the light rail and urban densification along that corridor it will be even busier. 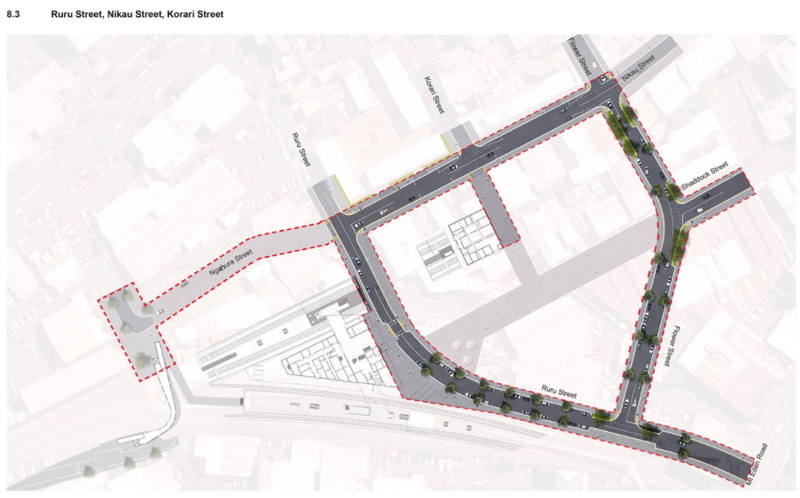 Yes, demolish the motorway centric fly-over and turn the lot into a normal arterial set of traffic lights, then close George St so there’s one less level crossing to worry about. Yes to all the new land around the road intersection creating council income through smart development (there was a design exercise for this when I was at council over a decade ago that showed the development potential and how the income paid for the ‘cost’ of making the intersection human scale). A lot of the development intensification shown in the model around the existing Mt Eden station could take place around the new intersection. Build in the potential for the Newton Station to be added later – less than a decade after the CRL opens it will be full (like the first attempt at the harbour bridge) and your kids will be asking why you didn’t do it properly the first time. Maximise the number of trains through the CRL, even at the expense of cancelling any through trains that would have saved 5 minutes by shortcutting straight through to Newmarket to head south. yes, move the station, but don’t bugger up the potential of the original Dominion Rd LRT scheme by reducing the number of stops along it and then extending it out to the airport. The first part of the airport links can be the start of the east-west link, airport to Howick, with a new multi-modal interchange at Wiri so as to pick up the proposed high frequency trains to Hamilton.